Sennheiser HD 598 headphone is not only dapper but also stylish. The sound quality and performance make this headphone quite popular amongst teens and youngsters. Sennheiser is a brand that offers luxury headphones and this headphone is no different. 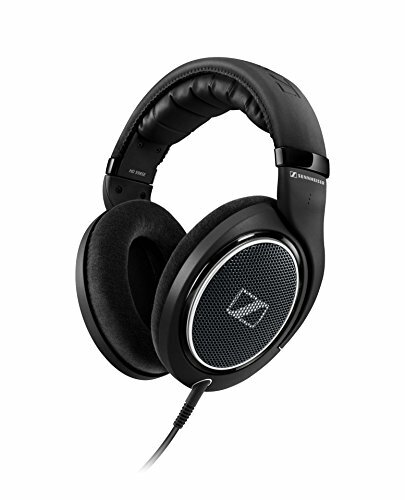 Sennheiser HD 598 has a high resolution and deep sound effect as compared to other models available. It also offers a wide-open soundstage, which sets it apart. Sennheiser headphones are genuinely popular because of the quality and performance they offer. Sennheiser HD 598 is also a great sounding headphone and sleek in design as well. Sennheiser HD 598 headphone is highly optimized in technology. It offers surround reflector feature that helps to deliver clear sound. As the headphone is quite light weighted, you can easily carry it on the go. You will not really miss your playlist while traveling now. The headphone also features Ingenious E.A.R. Technology that helps to replicate your musical rhythms with outstanding sonic clarity and accuracy. The headphone provides remarkable audio output and with a great price tag, it should be a must buy option in your list. Sennheiser HD 598 is compatible with almost every audio device and that makes it more flexible and easy to use. If you love funky and retro design in a headphone, then this should be your ideal choice. If looks matter to you, then don’t think twice before purchasing Sennheiser HD 598 headphone. It’s one of the best-looking headphones as compared to other headphones available. This headphone is great for home theater or hi-fi stereo. If you love stereo sound technology and you are finding a headphone for home theatre integration, then well this is again an ideal choice for you. Though apt for gaming needs, you still need to consider the actual use. If you are specifically looking for a headphone for gaming, then you might be slightly disappointed with this headphone. As it helps to mimic the surround sound, the performance is excellent. Every sound that you will hear will be clear enough so it’s good for music as well. Sennheiser HD 598 headphone is designed keeping home audio needs in mind. It may not fit the bill for studio sound or mixing. You can use it for your regular music or watching a great movie. If you don’t like bulky headphones, then Sennheiser HD 598 headphone can be great for you. It’s light in weight so you can carry it anywhere you go. The headphone is popular for its stylish and sleek look. If you want to flaunt your headphone in style, then you can go ahead and buy this amazing looking headphone at a marginal price. There are many great features of Sennheiser HD 598 headphone; let us look at some of the key features. The headphone offers outstanding precision. The open back design adds to exceptional tonal balance, sound, and sharpness. Its great performance is an added advantage. Sennheiser HD 598 headphone has a distinct style. It features high-gloss burl wood accents and best black metal mesh enthused by European sports sedans in its own class. The headphone has the best components. Sennheiser as a brand engineered transducers uses aluminum tone coils delivering high competence, outstanding dynamics, and enormously low distortion. Sennheiser HD 598 headphone is not only light in weight but it’s also great in comfort. The headphone has a strong feel with comfortable velour covered ear cushions and a padded leatherette headband. This actually does not put any kind of pressure on the ears. You can wear the headphone for hours without any problem. The headphone features premium compatibility with all the devices. It can be well connected to tablets, computers, cell phones or that matter any virtual device. It’s popular because if it’s compatibility feature. The connectivity of the headphone is also good with a single-sided detachable 3m cable (Oxygen Free Copper). Its gold-plated 6.3mm connector and 3.5mm adapter gives it a very fine edge. There is absolutely no problem with connectivity. The headphone offers deep, audiophile-quality sound and that helps to enhance the overall clarity of the headphone. Sennheiser HD 598 headphone is available with two plastic extenders and that makes the headphone great in fit as well. The headphone is available with a small pivot to the base that lets you adjust the headphone according to your ears and your head size. The headphone has Ergonomic Acoustic Refinement (E.A.R.) technology that provides precision clarity and a great listening experience. The technology helps to provide detailed audio delivery and that makes all the difference. It’s great as compared to other headphones available in this price range. Sennheiser HD 598 headphone is available with 3.5mm adapter. Sennheiser HD 598 Special Edition Over-Ear Headphones - Black "Discontinued by manufacturer"
Comfort wise, Sennheiser HD 598 598 headphone just excels. You actually feel like cushion comfort in your ears. The ear cups are not only comfortable but also durable. You do not feel any pressure wearing the headphone for a longer duration of time. If you compare the headphone with other models, then this is way better in comfort and fit. If you have a medium size, then it will fit you right. With a large head size, there may be a problem when you wear it initially. But, again it will fit in later. Rarely a headphone that looks so great is also good in fit. Sennheiser HD 598 headphone is simply the best on this front, so you can consider it. Sennheiser HD 598 headphone does not have noise cancellation feature but it can lower the sound when you hear your music. Depending on the range of frequency and sound, it lets you adjust to the level. The second series C of the headphone is available with complete noise isolation feature. Still, it is great if you carry the headphone along with you while traveling. The music is clear and you won’t be disappointed with it. The sound quality of the headphone is good if you compare it with other feature and limited edition headphones that are available. The retro styling feature of the headphone not only makes it super stylish but also ideal to flaunt it. Sennheiser HD 598 has comfortable velour ear pads and headband and that makes it all the more awesome. With this comfort, you can wear the headphone for hours at a stretch. It’s ideal for watching back to back movies or listening to your playlist for hours. The audio cable can be removed according to your comfort. Sennheiser HD 598 headphone is extremely light in weight. You won’t find a perfect mix of a great design and a great performance as you would do in this headphone. The sound quality of Sennheiser HD 598 is superb. In fact, the sound is the very sharpness of balance, with rich lows and no distortion even at top volumes or volume, which is on the higher side. The clarity is crisp and the frequency is also great. It features Sennheiser’s Eargonomic Acoustic Refinement technology, that uses audio baffles inclined at a small angle to guide the sound that reaches directly to your ears. So, if you are listening to your music or you are watching a movie with your headphones on, you will only be glued to the same. There will not be any kind of disturbance in sound. You don’t need to recharge the battery as it’s not applicable. The connectivity is through the wired jack so the sound you hear will be crystal clear. The best part about this headphone is that its compatible with most devices. You don’t have to purchase individual headphones for your needs. As you can use this headphone with your tablet, your laptop, and your phone, it’s easy to carry it everywhere. The wired connection is also great and there is no such loose connection. Sennheiser HD 598 headphone has a great sound. It may be bulky for your liking. There are no added options. You need to carry it separately. For a great experience in sound and quality, Sennheiser HD 598 Headphone should be your ideal pick. This headphone is so stylish that you would love to carry it everywhere you go. And because of its great looks, it’s quite popular as compared to other headphones that are available at this price. You can watch movies and listen to your favorite tracks for the whole day. There is no pressure on your ears so it’s absolutely safe and comfortable too. Neodymium ferrous magnet system makes up for an outstanding dynamic response and that makes this a great pick. If you are looking for a headphone on a budget, then this gives you value for your money. It’s great in sound and with added features; you won’t regret buying this as well. It’s a decent headphone in mid-range and it will surely blow your mind with its performance. So, for all you music lovers, this makes an ideal choice for you. Liked this Sennheiser HD 598 headphone review? Comment below to leave your feedback!